Hockey fans of a certain vintage will enjoy this pop classic. The night after the Leafs lost to the Rangers on their home ice. Coach Punch Imlach scanned his Rochester farm team's roster, took a deep breath and put in a call to Mr. Edward Shack in Rochester. "Hustle on up here," Imlach told Eddie, "and do something." Imlach called just the right person, for Shack's talent is unique. Nobody has ever confused him with any of the world's great hockey players. No sir. But take a perfectly orderly and predictable turn of events, point Eddie in its direction, and duck. Suddenly what was orderly becomes a wilderness of confusion, excitement and unpredictability. Shack does have a fair turn of speed, but his splendid rushes up the ice are often completed with a futile circle of the opponent's net. At times he makes abandoned assaults on the unoffending sideboards just because they are there. Opponents, teammates, referees—all have been clobbered by Shack and all at the most unforeseeable times. A few years ago one of Toronto's more experienced forwards, Bert Olmstead, had cannily avoided a vicious check by an opposing defenseman in white only to be flattened in mid-ice by his teammate Shack. Olmstead got up, regathered his gloves and stick, pulled a fistful of Eddie's shirt out in front of him and yelled: "What color is it, Eddie, what color is it?" "That's right," said Olmstead, "it's blue. Stay clear of it, Eddie, for Pete's sake, stay clear of blue!" 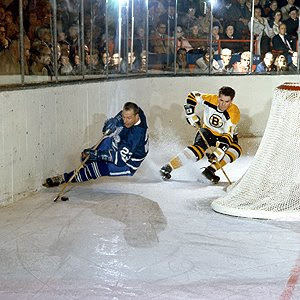 Above: Eddie Shack, at 45 degree angle, with the Leafs.